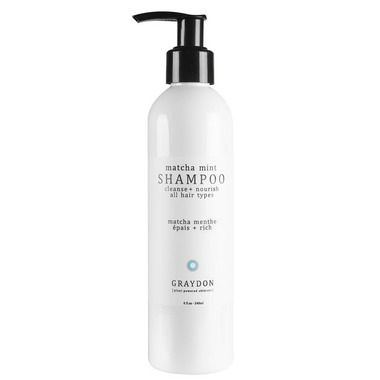 Graydon Matcha Mint Shampoo is formulated to be light and smooth to leave your hair feeling cleansed and nourished. It is infused with matcha tea to soften hair and prevent split ends, chia to help hydrate and fortify hair, sunflower seed extract to enhance thickness and sheen, and hemp oil to moisturize and strengthen hair to prevent breakage. With a light scent of peppermint and vanilla, this creamy, moisture-rich formula will leave your locks healthy and silky smooth. Oh and by the way it's green! Matcha and chlorophyll give this shampoo a gorgeously green tint and a dose of hair loving superfoods. Happy lathering! Sunflower Seed Extract • enhances thickness and sheen. Usage: Wet hair, gently shake bottle, massage into scalp and rinse. For a deeper cleanse lather, rinse, and repeat. Follow with our Hair Smoothie for a complete hair care routine. I like the shampoo but the consistency is like water so you end up having to use more than you should which gets to be expensive! Love all of Graydon's stuff, but this shampoo is great. Thoroughly cleans, leaves no residue and moisturizes very well.